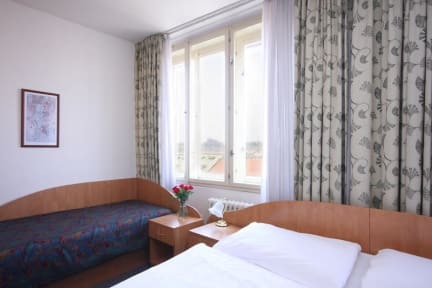 Hotel Legie, Praga, Czechy : Rezerwuj teraz! Hotel Legie has great central location. Many restaurants, bars and shops in the vicinity. Historical centre 10 minutes walk. It is located just 300 meters from Wenceslas Square. Hotel offers multibeded rooms – quadruple, triple, double and single room, all with private bathroom and TV. WI-FI is in lobby bar only. Hotel has nonstop reception with friendly stuff. Buffet breakfast is included in the price. The check in and out times can vary depending on occupancy at check in or check out day. Individual agreement may apply. Payment upon arrival by cash, credit cards, debit cards (Cash CZK or EUR, Visa and Mastercard).